"Attunity provides solutions designed to simplify and accelerate the transfer of data to, from, and across Amazon Web Services." 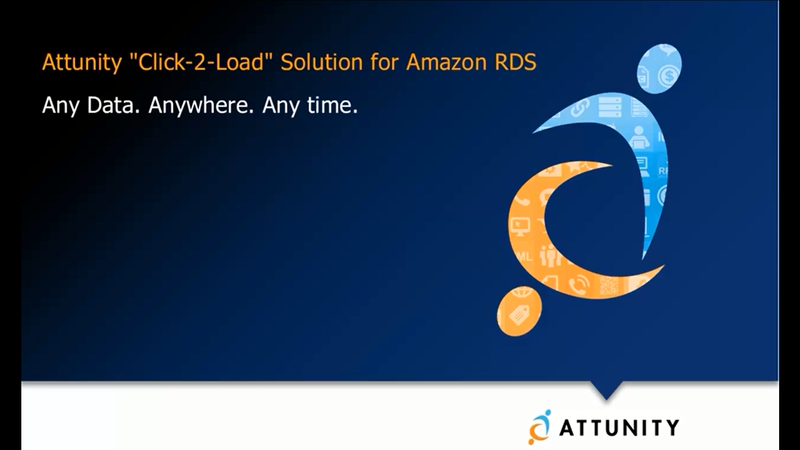 "Attunity Replicate for Amazon RDS enables organizations to simplify and accelerate the loading of data and incremental changes from a variety of heterogeneous sources to, from, and between Amazon RDS instances. Transformations: Flexible target database schema mapping and transformations"
"Knowing that Amazon RDS customers value easy set up and minimal administration, but at the same time, high-performance and cost-efficient solutions, Attunity’s ‘Replicate’ solution proudly reflects these advantages. Within minutes, customers can leverage Attunity Replicate to manage data integration, with simplicity and acceleration, across Amazon RDS and other compute environments."